Sagamore Hill, President Theodore Roosevelt’s home in Oyster Bay, Long Island. During the seven summers he served as President it became known as the summer White House, as it played host to numerous visits by foreign dignitaries and also peace talk to end the Russo-Japanese war. 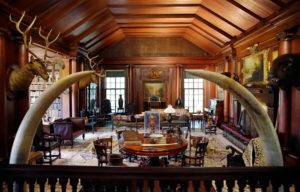 The building in the Orchard, home to one of his sons, has been converted into a museum with exhibitions and films dedicated to the history of the Roosevelt family. The historical site has 97 acres of forest, meadows, tidal salt marshes and a bay beach with walkways and nature trails. Time to explore what there is to see. On the way home we are stopping for a nice lunch and plan to be back in the city around 5 pm. As space is limited, first come, first served. More detailed information will be provided to registrants closer to excursion date.